Feisty, smoky, earthy, and tropically tempting with Latin flair. Place the bell pepper at the bottom of a highball glass, fill the glass with crushed ice, add the tequila, mescal, juices, and simple syrup, and stir to combine. 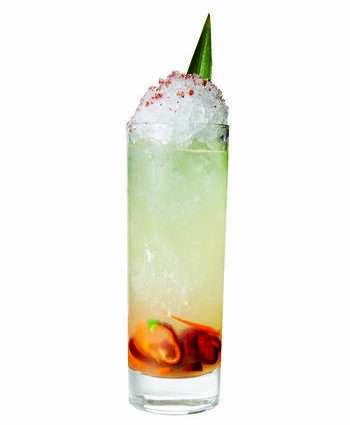 Add a mound of crushed ice, sprinkle with the spice mix, garnish with the pineapple leaf, and serve with a swizzle stick. Add a spicy kick to any cocktail with this sweet concoction: In a medium pot over medium heat, combine 3 cups of sugar and 1 1⁄2 cups of water and stir until dissolved. Remove from the heat, add 1⁄2 of a seeded and thinly sliced habanero chile, cool, and strain, discarding the solids. Keep syrup refrigerated, covered, for up to 3 weeks.